I've been to Ithmong to see the Queen. Mirriam shrugged and kicked a pile of dust that was one of a thousand of identical mini-dunes scattered across the incredibly bleak landscape she had been treading through for the past few hours. It collapsed, sprinkling her bare feet with specks of matter that did not truly exist, and making her blink at the memory of real deserts left behind. The dust was drab-grey as was almost everything else in here, including the skies, the ground itself, and the ever-shifting outline of the mountain range on the horizon. There were no sun or stars in the sky above, nor was the slightest flux of breeze in the air. In spite of this, the land was awash with a dull grey light that permeated the space rather like water fills a pond – pouring from nowhere in particular but flooding all accessible volume. Mirri had been meandering through this strange flatland for a very long time, without feeling thirst or hunger, or even tiredness – just dull boredom. It was neither warm nor cold in here, and she wondered absentmindedly if the tactile sensation of hard soil under her bare feet was as false as the rest of this strange world. In any case, even that secondary illusion of touch seemed to be fading with every passing hour, and once or twice she had caught herself gliding an inch or so above the ground, instead of walking upon it. Tentatively, she raised her hands and glanced at the ugly ragged wounds on her wrists. They had stopped oozing dark ichor some time ago, and now looked paper-dry and somewhat unreal. Vaguely, she recognized that she ought to have worried about them, but it felt irrelevant – they were something as trivial and unimportant as her complete nakedness, or the lack of stars in the sky. Mirriam tried to remember the reason behind the cuts, but the very effort of forming a coherent thought was too much to bear, and she was too preoccupied with making her next step right after finishing the previous one to bother with memories. Eventually, she shrugged, and let her arms drop to her naked sides. Oddly enough, after that gesture, the ground upon which she was striding seemed to acquire a transparent, smoke-like quality, and she caught a glimpse of tiny star-lights blinking through the threads of grey matter under her feet. But even the stars and the new reality that lay below failed to hold her interest for long. Mirriam knew that eventually she would have to go down there, and seek the new Plane she was bound to. Most likely it would be some warm and sunny place, full of frolicking spirits that had dedicated their lives to worshipping Tymora. Yet the young thief did not feel lucky at all, as a matter of fact, the girl had a vague feeling that Lady Luck had failed her miserably, even if she could not remember when and how. Subsequently, the notion of entering Tymora’s festive domain made her feel ill at ease. But even this mild defiance felt as pointless and insignificant as her present whereabouts. Mirri simply wished she could cease to exist, and that desire was the only emotion that forlornly flickered at the edges of her empty mind. Yet while Mirriam disinterestedly observed the fading sand and dust that were no longer solid matter, something warm and soft thumped at her leg, rubbing against her skin with a jerking energetic motion that could have only been produced by a living creature. The girl shifted her gaze in dull surprise, and almost yelped – right at her feet sat a small white cat, with eyes as bright and green as tree leaves in midsummer, not unlike the stones on the face of Mirri’s once favorite cat-ring. The small ivory band had been given to her in mocking jest while doling out looted treasure, by one who had never cared much for the importance of his gift. ‘The safeguard’, Jon had called it. Yet Mirriam had forgotten all about its supposed magical qualities. The trinket had always been Jon’s ring to her, and that fact by itself had been more than enough to make it her greatest treasure. Something pricked at Mirriam’s heart just then, like the jab of a tiny needle that brought back carefully dulled-out sensations of pain. Even as the girl winced in distress, the ground around the cat’s paws solidified back into an unyielding grey surface. At that very instant, the animal sat back on its hind legs and meowed, looking at her questioningly. “What do you want of me?” Mirriam asked, feeling surprised at the sound of her own voice; it felt as out of place here as the presence of a living animal. Feeling oddly reluctant, she squinted at the cat: it was pure white but with faint traces of ivory visible on its back and around the ears. 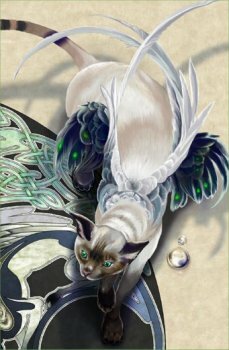 The creature purred and trotted a few steps away from her, then sat on the ground and began to clean itself, ignoring Mirriam completely. Something prompted her to lift her head just then, and her mouth flew open with an undulating ‘O’ – the sky over the far-away mountain peaks had turned faintly pink, as if touched by the first rays of dawn. It was fairly strange – Mirri was certain there could be no colors or scents in this place, and yet she could not have explained how she knew it... only that it was indeed so. She frowned in distress over the growing number of deviations from the well-established reality of her grey world, and blinked: where only a few minutes ago there had been nothing but a dull, slightly wavy surface of sand, now stood a clump of pale leafless trees, with bark that looked as scaly and wrinkled as the hide of an ancient dragon. “Now what?” Mirriam asked the cat accusingly. “Why are you doing this to me? I have no desire to...” But while she had been looking at the trees, the animal had risen from its sitting position and was now trotting in the direction of the silvery grove, all the while radiating a feeling of mute confidence. Mirri followed the cat into the elaborate mesh of silver-white branches and roots. Even at closer look, she could not recognize the trees which were low enough for her to reach their lower nodes. The silver-scaled boles were short and quickly divided into several thinner fluted stems; each individual tree was twisted and tangled with its neighbors into near indiscernible shapes, resembling the complicated knots that her father had used to make out of rope to entertain her when she was little. She put her palm, still stained with dark blood, on one of the elephantine trunks – it felt warm. Something tingled across her skin, and after she quickly withdrew her hand the bloodstain was gone and the wound looked less deep. She frowned in defiance, yet the furrowed silver boles looked surprisingly sturdy, and broad enough to provide a cozy resting place. Mirriam did not feel tired at all but it seemed like it would make an adequate change from her aimless wandering around the grey desert, so she pulled herself up and nested in one of the wider intersections, folding her legs and leaning back against the surprisingly soft and pliable bark. The tree shifted under her body, and she could swear that it had readjusted itself to provide her with a more convenient curvature. “Dying is never a private matter, and you should not trick yourself into believing otherwise,” a pleasant male voice replied from the direction of the ground. Mirriam flung her eyes open – at the base of her chosen tree stood a slender man of an average height and build, clothed in a non-descript tunic of grey fabric, belted with a piece of rope. The man on the ground lifted his chin into the air, and burst into a peal of laughter that made his sad and worn face look boyish and charming again. Dark ringlets of hair fell over his pale brow, deep brown eyes lit with a flicker of merriment, and Mirri suddenly realized that he was quite handsome, in the unobtrusive, unpretentious way of the perpetual second-best student in the class. The man wanted to add something else, but after a quick glance at her embarrassed and slightly angry countenance, sighed and went silent. Nervously, he raised one of his long-fingered hands, pushing away a strand of sable hair laced with silver, and Mirriam noticed that his ears were slightly pointed at the tips. They were not as sharp and animated as those of a full-blooded elf – and by now Mirri had had enough familiarity with those flighty appendages – but possessed a duller, leaf-shaped silhouette that was midway between her own rounded pink shells and the elven cat-like triangles. “Who are you then?” The girl asked earnestly, suddenly filled with desire to learn more about her visitor’s identity. She was not scared or even remotely worried about his presence. After all, the worst that could have possibly happened to her had already come to pass. Death brings a certain reckless quality to one’s manners – Mirri could not argue with that. Alas, she had never been overly cautious or shy, even in life. “My name is Rielev,” the man – or rather the half-elf – answered politely, after finally overcoming his sudden fit of shyness. “Please accept my apologies for my atrocious manners. I was rather taken by your... individuality. It is no wonder that he felt attracted to you, albeit briefly.” Rielev gave her a quick glance and reddened, catching her disapproving scowl. Mirriam almost chuckled, despite her intention to remain composed. His skin was very sheer, and when he suddenly flushed cherry-red to the very tips of his pointed ears, it was a rather funny sight. “Does he realize how much of his living personality is projected into his spiritual image?” She wondered briefly. The sudden clarity of her own thoughts had surprised her greatly, and she had to put it to the curative effect of the tree she was sitting on. “You don’t understand,” the one who called himself Rielev shook his head in visible distress. “This is something much bigger than one person’s private life... and you were extremely unlucky to stumble into this particular pit... Yes, I have been watching Jon’s progress, and that of everybody closely associated with him, simply because I can never be at peace until it is all over. I saw what happened to you... and what has ensued. You have been badly hurt simply by virtue of having met Joneleth, and since it is partly my fault, I feel you deserve to know the whole story.” Rielev sighed and looked at her with the expression of a sad dog pleading for his master’s forgiveness. “Would your tale have a beautiful elven queen with eyes blue as the summer sky and hair of spun gold?” All of a sudden, Mirri’s own dark eyes blazed with hot anger. However Rielev could see a wave of crimson creep over her tanned cheeks, even as she tried to hide her rapt interest behind the mask of fury. “Queen Ellesime’s eyes are green. And when I last saw her she was more of a redhead. But I suppose it is close enough,” the half-elf replied uneasily, feeling at a complete loss as to how to deal with this sudden complication. He noted that the girl instantly recognized the name of her rival, for she flinched at its sound; yet he could only guess how she had found out. Rielev opened his mouth to protest, and snapped it shut under the unrelenting pressure of her stare. Mirriam’s eyes bore into him like two gimlets and the half-elf felt an uncomfortable sensation of being weighed and found wanting. “Fine, spill the beans if you wish.” Her hands snatched one of the loose strands of her hair, and pulled at it so viciously that Rielev felt grateful that Mirri’s spiritual form could not do any more physical damage to herself. “Just don’t expect me to get all sappy and wish them eternal happiness while I rot in my grave!” The last look that she threw at him could be best described as murderous – yet deep under her trembling dark lashes he could spot a glimmer of dying hope. Once again night had spread the velvet canvas of her marquee over the glades and valleys of Tethyr, and the distant pinholes of stars flickered quietly among its indigo folds. The silver disc of the moon had floated into the thick veil of clouds, and the glittering constellations of the summer sky remained the only source of light for those trapped between the majestic display up in the heavens and the rich moist soil of the Great Forest of Tethyr. After a rainy morning followed by a hot sunny day, the woods were bursting with life in all shapes and colors. Yurick Gulderhorn, the third and youngest son of Viscount Gulderhorn, cursed and slapped himself on the cheek, scowling humorlessly at the raised eyebrow of his impassive companion. The damned natives seemed to be completely unaffected by bugs, he thought in annoyance, and on this warm summer night the forest was virtually swarming with a buzzing and stinging multitude of pests that were particularly attracted to Yurick’s pale freckled skin. The majority of elves inhabiting the Great Forest of Tethir, (or the Forest of Wealdath, as his liege lord had called the place when addressing Queen Ellesime), were half-naked, copper-skinned warriors from the Suldusk and Elmanesse war-clans, although there were a few pale-faced exceptions, especially among Ellesime’s courtiers. All the warrior types were extensively tattooed and painted with strange designs from head to toe. Yurick privately considered the custom a barbaric one, but King Errilam seemed to find it romantic and even enticing. Most likely because the queen herself sported a few delicate green and turqouse swirls along her prominent cheekbones. Yurick was not sure if these were permanent tattoos or not, but the very look of them made his stomach churn. Ellesime must be a witch, he had decided privately, and the tattoos were part of her wicked magic – there was no other explanation for the effect she had on the King. Ever since his ascension to the throne a few years back, King Errilam had been a frequent visitor to the elven forests. Being the younger son of King Haedrak II, raised to be a governor of one of the smaller provinces under his Royal sister but with no prospect of ever taking the throne, the prince had had his fancies, and when at the ripe age of thirty eight the tragic circumstances (namely the slayings of the seven Tethyran princesses in the city of Waterdeep and his father’s subsequent demise), had suddenly made him King, Errilam had been reluctant to give up his dreams of elves and fairies, and continued to maintain connections with his elven friends. Lately though, those connections had become more intense, and his visits to the heart of the Great Forest had intensified, becoming the main topic of his court’s gossip. Errilam of Tethyr had turned one and forty last spring, but still adamantly refused to take a wife and produce the heir to his throne. And what had been considered a minor eccentricity in a duke of a minor dukedom had become a major issue for the King. Undoubtedly, everybody still remembered the 1218 disaster, and the rule of the accursed half-elven Usurper – the Shade King Kymer. Yurick smeared the remains of the dead mosquito over his neck, wiping his bloodstained fingers on his leather pants. In this warm and humid weather he was sweating profusely inside his studded armor, and was spitefully jealous of both the half-naked elven guards and Ellesime’s courtiers in their flimsy silk and feather outfits. Yes, most likely the elven savages were protected from insect bites by their thick copper-colored skin and greasy body paint. Still, even Yurick’s mild-tempered guide and translator, whose slightly blunt ears and sad brown eyes that were round rather than almond-shaped betrayed his mixed bloodline, seemed to be completely ignored by bugs. Velemir’s silver-white tunic was of a much plainer cut than the clothes of the majority of the celebratory crowd, but it was made of thin silk and could not provide much protection. Verily, even the insects in the accursed wood were in league with the elves and preferred to feed solely on the human! Velemir looked at the young man, sighed, and muttered a brief incantation; the buzzing noise around Yurick’s head rose to a brief crescendo and then vanished altogether. The evening was progressing routinely, the half-elf noted melancholically – he was stuck with the grouchy, sweating, ill-mannered human boy, while everybody else was out in the woods celebrating the approaching Faradome, drinking evermead, and generally having a good time. “Why didn’t you do it earlier?” The human youngster grumbled discourteously, and hid his eyes in embarrassment. “Thanks anyway,” he added after a brief pause, blushing fiercely under his freckles. He was not sure about the degree to which he could trust the half-elf. Velemir’s thin intelligent face looked young enough to belong to one of Yurick’s older brothers, yet there was a certain tiredness around the half-elf’s eyes that suggested an age closer to that of Yurick’s father. Still, Velemir was almost human… if only when compared to the rest of their hosts. What frightened and angered the young man about elves, making him seethe in hopeless ire and frustration, was the way they looked at him without actually noticing, as if he was transparent or was wearing an invisibility charm. He knew that for them he was a curious specimen: something as ephemeral as an annual plant doomed to perish with the next coming of winter, a short-living vermin that by some strange trick of nature could issue a few half-intelligent sounds in Common speech. But then, so could kobolds and similar small pests, and who would ever bother to stop and have a meaningful conversation with a kobold? He nodded in the direction of the crowd of festively dressed, smiling and singing elves that filled the Queen’s Gardens on the first night of the long Solstice festival. The low tables under the whispering plum and apple trees, which were heavy with ripening fruit, were loaded with fare: loaves of elven bread, heads of white and yellow cheeses, pastries and sweetmeats stuffed with nuts and raisins, jams and preserves from the Queen’s personal larders, and various other exotic dishes mostly vegetarian in origin. There were also bottles and pitchers with multicolored wines, ciders, and meads, and a giant punch bowl frequently replenished with Elverquisst – an elven summer drink, brewed from early fruit and rare herbs. The fruit trees themselves were decorated with small silk lanterns fashioned to resemble butterflies, fairy-dragons, and rainbow-colored hummingbirds, and enchanted to glow in the dark with a faint magical light. The Summer Solstice was only a few nights away and every one of the remaining days and nights in the city of Suldanessellar and its surrounding settlements will be filled with feasts, celebrating the victory of Corellon Larethian over the orcish god Gruumsh the One-Eye. Over the remaining few days the celebrations will become more and more abundant and culminate in an orc hunt on the night of the Solstice itself. Rarely was a human ever invited to such a festival, and King Errilam’s friendship must have meant a lot to Ellesime, if she had decided to violate the centuries’ old tradition that banned N’Tel’Quess from such important religious holidays. “No,” Yurick shook his head violently, “I have already eaten tonight.” That was a lie – his stomach growled at the very sight of the rich foods, but he was not about to be poisoned by some savage delicacy and rendered unfit to perform his duties. Ever since the early morning, when they had first arrived in Suldanessellar, Yurick had sustained himself on dry field rations and water despite his liege lord’s many chuckles and jokes about Yurick’s ridiculous superstitions. That was Yurick’s major grief with this enterprise. Errilam of Tethyr was a kind soft-spoken man, a shrewd and energetic politician, and a relatively efficient military commander. Yurick adored his liege lord with all the vigor of his young heart. Yet when it came to dealing with the elves, and especially with their Queen, the always controlled and reasonable Errilam turned into a young hothead, who could not tolerate a single word spoken against his fancy. Yurick opened his mouth to reply, but Velemir was already walking in the direction of the lonely figure under the towering tree, and the human had to cut his curt remark short. Being called a ‘boy’ at his hundred and twenty years was not exactly a balm to Velemir’s sore spirits, but he knew that in elven terms he was still considered quite young, and in any case Jon had at least a century and a half on him, so he did not dare to protest. Having spent the last seventy-six years of his life in Tethyr, surrounded by his full-blooded kindred, the half-elf had forgotten much of his Evereskan cosmopolitanism, and had easily become almost as reclusive and conservative as the rest of Suldanessellar’s inhabitants. Astoundingly enough, these decades had had no visible effect on Joneleth, who remained as skeptical and mockingly rebellious in his conversation as he had been through all his years in the Evereskan Academy of Magic. It seemed that even seventy years of continuous happy relationship with Queen Ellesime had not affected Jon’s sharp and devious mind, but Velemir assumed that geniuses had their own ways of battling routine. Sighing deeply at this latest putdown, the half-elf turned in the direction of Joneleth’s amused stare, and beamed at the sight of the newcomer. The approaching female was young, thin, and almost ethereally pale: a slip of a girl in a richly decorated gown of heavy silver brocade, studded with freshwater pearls and sparkling blue gemstones. Her face was long and bony, with a bold prominent nose and a wide forehead that made her not particularly attractive by elven standards. Yet she possessed certain elusive charm, and her pale silver eyes glowed with good humor and intelligence. Her rich outfit looked too heavy for her lithe yet fragile form, and completely out of style among the crowd of half-naked elves. Still, Rielev suspected that her dress, as well as her costly jewelry and the elaborate hairdo had been planned in advance with great care, and implemented with the meticulous patience that she always possessed in endless supply. Patience unheard of and implausible in a young person of her age be it human or elven, but perhaps natural in the one of her kind. Her bright metallic eyes looked straight into Jon’s, and Velemir noted that even Joneleth found it increasingly difficult to refuse her bidding, even though he must have suspected that the young silver dragon was simply trying to distract him from thinking about Ellesime and the queen’s present whereabouts. The young dragon opened her mouth to answer, but at that very instant a single silver note of a hunting horn, followed by loud cheers from the crowd interrupted her reply.